Trenton, FL--The Fellow Travelers have been rather lucky on their Thanksgiving weekend outings. The aim is to plan a trip a little farther south hoping that the fall t emperatures will be bearable. This year at Edwin McCook’s suggestion the goupr reserved the picnic shelter at Otter Springs near Trenton, Florida. The Suwannee River Water Management has recently obtained the former KOA park and leased it to Gilchrist County. The county is doing a good job and it will likely be as well run as the Hart Springs Park. Weather predictions for November 27 and 28 got worse as the trip neared. The low for Friday night was supposed to be in the mid-thirties. Had the prediction been for slightly colder temperatures the trip would have been canceled. Fortunately, the paddlers elected to go although a few backed out of the journey. Diane and Charlie left Moultrie about five to make the drive. They stopped at Akins B arbecue in Bell and were joined by the Shelfers for an excellent breakfast. From there it was to Otter Springs. Greg, Jeniffer, Ashley, Sean, and Katelyn Ferrell were already there as was John Williams. Roy, Dave, Eric, Ashley, Sara, Jacob, and Kaytlyn Moye soon arrived. The Ferrells brought their Labrodoodle, Samson, and Diane brought her yorkie, Ami. The cars and canoes then proceeded to Eula Landing for a put-in at the ramp there. The temperature was in the forties and it looked like it might be a cold day on the river. It had warmed to about fifty by ten and the trip began. The Suwannee is a huge river at that point so the winds make the water somewhat choppy, but the canoeing was easy. Ashley and Katelyn took Sean in the Penobscot 16 and handled it like pros. The dgos behaved and so did the men. Greg Baker, Donald May, and Charlie Stines had scouted the section a few weeks earlier to get an idea of how long the trip to Otter Springs would be and to determine where the Otter Springs run empties into th e river. The entrance is rather obscure so the scouting trip proved to be valuable. However, they missed a couple of nice landings. 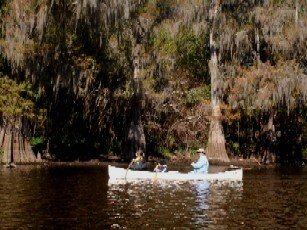 The Thanksgiving paddlers found Turner Point Landing on the west bank in Dixie County about eleven. It is a really nice area. By that time the temperature had reached the temperate zone. 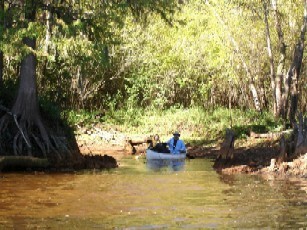 After leaving Turner Point the paddlers visited a small spring in the west bank. It was unusual in that the boil actually bubbled up about six inches above the water level in sort of a geyser-like fashion. The boaters were not much troubled by power boats and jet skis. Paddling c ontinued to be easy. At about 11:20 the entrance to Hart Springs Park was reached. Donald and Gloria May were there awaiting the travelers. Donald is still suffering from a very sore shoulder and did not feel capable of paddling but he did agree to shuttle the cars. The paddlers spent about an hour at Hart Springs. It is a really nice park and one where the travelers had spent the Thanksgiving weekend a few years prior. Samson and Ami enjoyed the freedom to run loose. The people ate snacks and candy. Then it was back to paddling at about 12:45. There was another nice Dixie County landing on the west bank not far below Hart Springs. It is called Purvis Landing and it, too, is a well-maintained area. Some boys were there practicing their rock-skipping ability. Some ingrate had killed a hog, taken the hams, and left the rest of the carcass there to rot. Charlie and Diane were at the head of the pack and reached the Otter Spring run at 1:40. Since the spring run is hard to spot they stayed there and directed the other canoes into the run. The run from the Suwannee to Otter Springs is a narrow, obstructed but clear stream. It is about three-quarters of a mile long. The water was sufficiently high to allow the canoes to pass over all the downed trees but the canoes did drag occasionally. It is a pretty paddle and was the favorite part of the paddle to John and some of the others. By about 2:20 all the paddlers had made it to the park. The Ferrells and Shelfers were the last to arrive. After getting out, Donald drove the drivers back to Eula Landing to retrieve the vehicles. 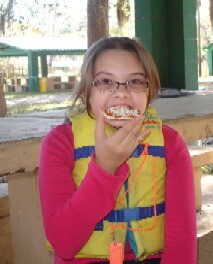 Upon returned the various families chose their campsites. Charlie busied himself getting everything ready for supper which consisted of a good beef stew and cornbread baked in the Dutch oven. John Williams cooked a very good pineapple upside-down cake in his Dutch oven. Charlie cooked one, too, but it stuck around the sides and no one ate it because there was enough of John’s and it was better. After supper the gang sat around the picnic shelter drinking hot tea and hot chocolate. It was getting cold. 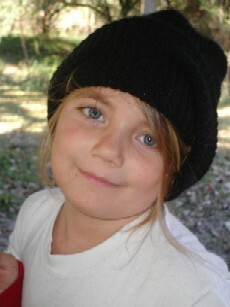 Janice Shelfer was afflicted with bronchitis so she and Art left. Brian Moye arrived after dark. The campers sat around either John’s or Roye’s campfire until time for bed. Most slept in tents, but Roy’s crew bought a campsite with electricity to use electric heaters and Diane and Charlie slept inside the Expedition. Charlie got up early to start fifty cups of coffee in the electric urn. Roy and Eric then came to the picnic shelter where they helped Charlie fry sausage and pancakes for the entire congregation. After cleaning up the mess the group got ready to paddle again. Donald shuttled all the drivers back from the landing at Old Town. 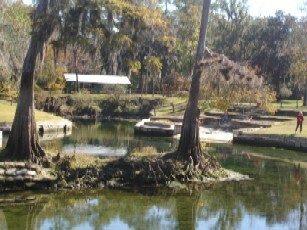 Old Town is on the west bank and Fanning Springs is on the east bank of the Suwannee. The paddle down the Otter Springs run began about 10:15. The weather was warming rapidly. Shortly after reaching the river the paddlers reached Copper Spring on the west bank. The spring is clear but does deposit brown copper re sidue on the vegetation. Although there are a couple of houses at the spring it is still a pretty place. There was not a wildlife. Several vultures circled and dozens were seen in trees. There were songbirds and turtles. A few fish jumped. An osprey flew over near the end of the trip. Once back on the river a few jet skis created some wake but nothing really dangerous. The former railroad bridge which is now part of the rails to trails system came into sight about 12:15. A couple of bicyclists were crossing the former swing bridge as the canoes passed underneath. It was only short time before the landing was reached. John had left the crowd behind and already had his canoe loaded when the others arrived. 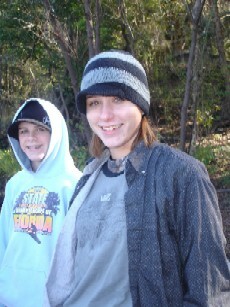 Some of the Moyes canoed across the river to Fanning Springs and saw two adult manatees and a manatee calf. After loading the cars and allowing the children a little time on the playground, everyone went home from a very good trip.